Picture yourself in this pool. It’s sunny. And hot―like 1,000 miles off the East Coast of equatorial Africa hot. The palm trees are rustling. The waves are crashing peacefully on the granite rocks below. There’s a hint of frangipani in the air. There’s not another soul in sight. 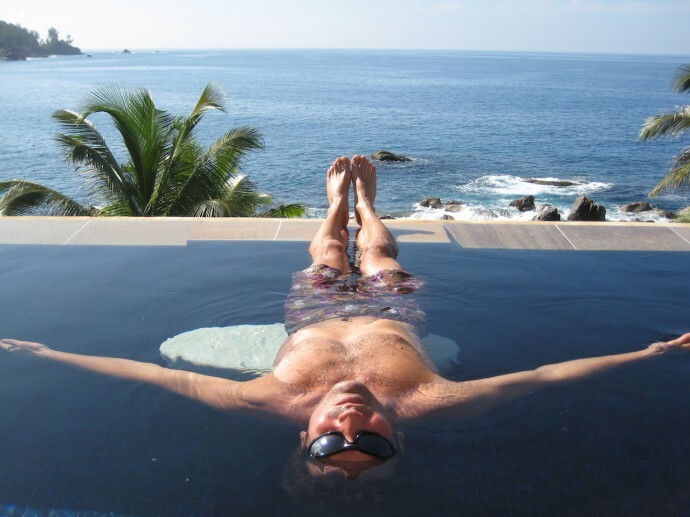 Your own personal infinity pool is…cool. The cucumber-infused water that has been delivered to the shade of your personal poolside cabana in your own personal cliffside cabin by a very nice person who smiles a lot is also…cool. And then it’s time for breakfast (also delivered by a very nice person who smiles a lot). I chose eggs benedict with delicious little rolls served in hopelessly exotic little baskets adorned with a delicate flower every morning. But you can get anything you want. Ahhh. Can you feel it? That wonderful combination of caffeine, carbohydrates, cholesterol, and comfort that’s possible when you start your day off in an impossibly luxurious resort? Click here to find out more about this magical place.